Last summer The Walt Disney Company took a big step into the realm of “virtual tourism” by introducing the Walt Disney World Park in Google Earth. 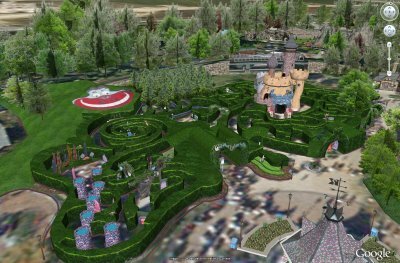 Users were able to click on maps that show about 1,500 rides, restaurants and attractions all in 3-D.
Now Disneyland Paris becomes the second park that is available for “virtual tours” to Google Earth users. Although I had difficulty using Google Earth to virtually tour the park myself, I am told that the 3-d buildings are stunning. Apparently more than 85,000 photos (450GB worth) were taken over a 20 day period for this project. The castle alone is comprised of over 354 textures derived from over 2,000 photos. While the buildings are superb, it’s really all the other detail that makes this data worth the virtual trip. There are over 500 unique landscape elements that were created to make the park look as realistic as possible. What’s more, each attraction has unique plant life associated with that area. For example, palm and tropical plants were used on Adventure Island. Desert-type plants were used in Frontierland, broad leaf deciduous trees were used in Main Street, pine trees were used in Discovery Land and shaped pruned trees were used in Fantasyland. If there were street or landscaping elements in the photographs, they were modeled. Essentially every bench, light post, tree, bush, planter box, street sign, fence, street curb, fountain, rock, bridge, table & chair are included. 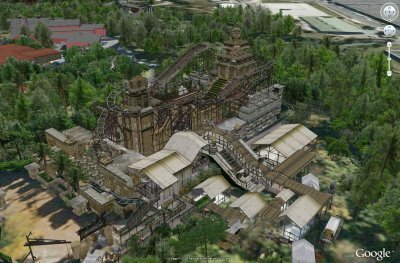 It is said that photographers rode the Indiana Jones Temple of Peril ride repeatedly in order to “understand the actual path of the roller coaster when modeling the attraction.” The model includes every loop, turn and climb. 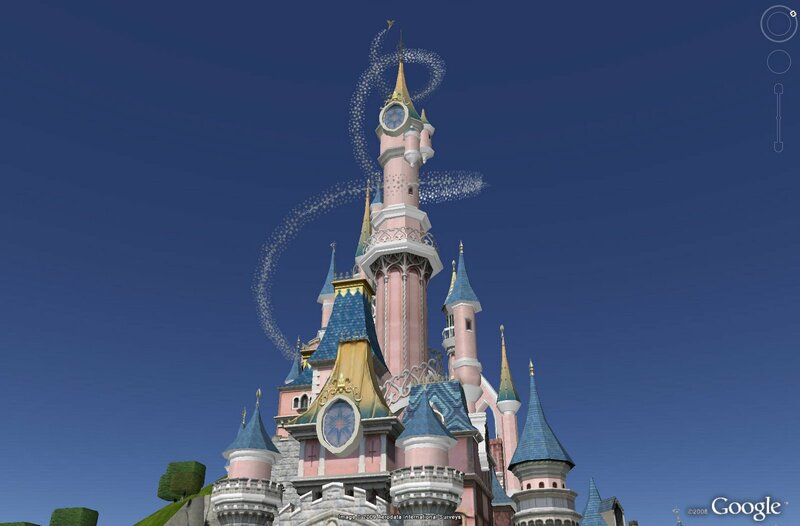 At the top of the Sleeping Beauty Castle, you’ll spy Tinker Bell, complete with a trail of pixie dust, adding just a little more magic to the layer. 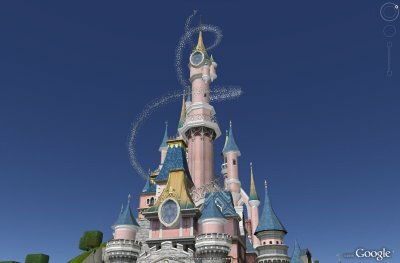 Disney developed a custom KML for each attraction in the two Disneyland Paris Parks, each of the seven Disney hotels and the Disney Village. Simply click on the area of interest and a KML bubble complete with Flash animations and sound will appear. You can navigate from place-to-place using this approach or simply use the 3D mouse and stroll through the park on your own at ground level. The Disneyland Paris layer can be found in the “Gallery” folder (note that you need to have Google Earth 5.0 to view the models). The layer is available in six languages: French, Italian, German, Spanish, Dutch and English.